In this multi-part series we bring you an attraction-by-attraction look at Disneyland's 1967 "New Tomorrowland" with lots of concept art, photos, maps, diagrams, and history. Throughout this series we'll ask you to refer to our custom map above. Click on it for a larger version you can save. Everything in that teal color represents New Tomorrowland of 1967 and everything else is a map of Tomorrowland today. It was referred to as “New Tomorrowland” and was a long time in the making. The original Tomorrowland offerings of 1955 were rather sparse. The Autopia cars were “everyone’s favorite thing to do in Tomorrowland.” For years Walt Disney felt the under-funded land was not quite “finished”. Walt and his creative people had in mind a much more elaborate land. In 1959 the exhibit-heavy original land was enhanced with the addition of the Matterhorn Bobsleds, the Disneyland ALWEG Monorail System, and Submarine Voyage Thru Liquid Space. These additions were fantastic by all accounts. Indeed it was the greatest expansion Disneyland had seen up until that point. But the bulk of Tomorrowland’s real estate remained the same. By the mid-60s Walt was ready to move beyond exciting topics like dairy! aluminum! and plastic! His fascination with modes of transportation (and perhaps a need for more rides) led to the clean and uniform new design of a Tomorrowland that explored “science and the universe of the future”. It was given a theme nicknamed “World on the Move”. Transportation in America at this time was an important issue. Cities were growing more crowded. More people were moving to the suburbs. Freeways were being introduced to more and more cities. Air travel was becoming more common. The first “jumbo jet”, the Boeing 747, was soon to take flight. The first manned trip to the moon was just around the corner. Walt Disney had commuted from his home in the Los Angeles neighborhood of Holmby Hills to both Disneyland in Anaheim and to The Walt Disney Studios in Burbank. He was working with the Ford Motor Company to build them a pavilion at the 1964-65 New York World’s Fair. He had flown all over the world for both business and for leisure. He was secretly flying to and from Florida in preparation for his “Florida Project”. Transportation was on his mind. Walt Disney’s “biggest dream” at the time was to build a prototype community called E.P.C.O.T. (Experimental Prototype Community of Tomorrow) on his newly-acquired property in Florida. Transportation was a major focus of E.P.C.O.T. It was only logical to test new transportation systems at Disneyland prior to building the city. Smaller-scale systems would double as theme park attractions at the park. Win win. Walt Disney test-riding a PeopleMover on a temporary test track. The mid-60s were by far the most ambitious times for Walt Disney and his themed entertainment projects. Pirates of the Caribbean and Haunted Mansion attractions were in development, the still-secret Florida plans were becoming ever more complex, the four World’s Fair attractions required tremendous time and resources. Plans for New Tomorrowland required an almost unattainable amount of advanced technology,namely computer technology needed for Space Port (later named Space Mountain). Then came late 1966. Walt Disney, at the helm of all these enormous endeavors, dies at age 65. Walt had lived to experience the World’s Fair attractions. Pirates, Mansion, and New tomorrowland opened after his death. His marvelous E.P.C.O.T. never came to be. Despite Walt’s passing, construction on New Tomorrowland continued forward. With a New Tomorrowland came a new fresh look. The colors were that of the space age (mostly white). Everything had a wonderful mid-century style. The architecture was a perfect blend of form and function. The facade of each attraction perfectly fit its surroundings. Visible from Disneyland’s central hub were Tomorrowland’s two shiny silver spires which drew your eye from the horizon up to outer space and back down to earth again. A similar effect happened with the main Flight to the Moon sign further west. Below your feet the sidewalks were a beautiful blue. Above you, PeopleMover vehicles traveled smoothly and quietly along a long slender track held up by modern-looking support beams. The PeopleMovers weaved in and out of every Tomorrowland building. A 90-foot rocket atop the PeopleMover station with 12 tiny rockets revolving around it grabbed your attention and drew you further into the land (Walt’s idea). Two deep black cube-like structures turned 45° with raised silver lettering invited you into the new Adventure Thru Inner Space and the CircleVision attractions. Mary Blair’s masterpiece murals added a warm color palette and a charming human touch to both sides of the the main walkways into the land. Soon you would come upon on the many organized and futuristic “levels” made up of the PeopleMover track, Rocket Jets, Skyway buckets, and the 1959 attractions, Matterhorn, Monorail, Submarines. Two entertainment stages offered a variety of musical performances. One of the covered stages slowly and dramatically rose up from out of the ground. The entire first floor of the new round Carousel of Progress building rotated. And at night the charm was even greater. Wonderful lighting set a mood like no other part of Disneyland. It was wonderland of sleek, kinetic edutainment. A wide variety of themes were presented (inner space, outer space, liquid space, progression of electricity, transportation, etc.) yet everything was presented in a non-conflicting way. (Can the same be said today?? I’m looking at you, Buzz Lightyear). For one, everything fit within the theme of “World on the Move”. Everything. A vague theme perhaps but nonetheless it was a central theme that worked. The “story” of each attraction was presented little-by-little as you approached each non-tacky, non-cluttered entrance. Upon entering, the “theme” was added upon in subtle yet effective ways. Once further inside, you were entirely immersed n the experience. The same experience happened in reverse as you made your way out the exit. If you never got to experience Disneyland's Tomorrowland before say 1995, watch the footage below. If you did experience it first hand, refresh your memory of this how it once was. And as a bonus you'll see some nice footage of other lands via jet pack! Tomorrowland soon became the most popular land at Disneyland. A decade later its popularity exploded once again with the opening of Space Mountain and the elaborate and ultramodern complex that surrounded it. Walt got his Tomorrowland and in time got his space-travel version of his beloved Matterhorn. If nothing else, you can go to Disneyland’s Tomorrowland today to look at some of the 1967 architectural remains. That sleek PeopleMover track is still there although it no longer hosts any sort of ride (not even a Rocket Rod). Those silver spires are still there (which is remarkable) and yep, they are currently silver (they were gold or brown or green for a while). Really, every building from 1967 is currently accessible to guests in one way or another. That’s good. The only attraction that opened in 1967 that still remains open is........ well, none of them. The Tomorrowland Terrace Stage is still there and still raises out of the ground. It doesn’t have that wonderful Rolly Crump sculpture atop but it’s quite nice (and it’s white!). In this Tomorrowland ‘67 series we will discuss each attraction and explore what still stands today. 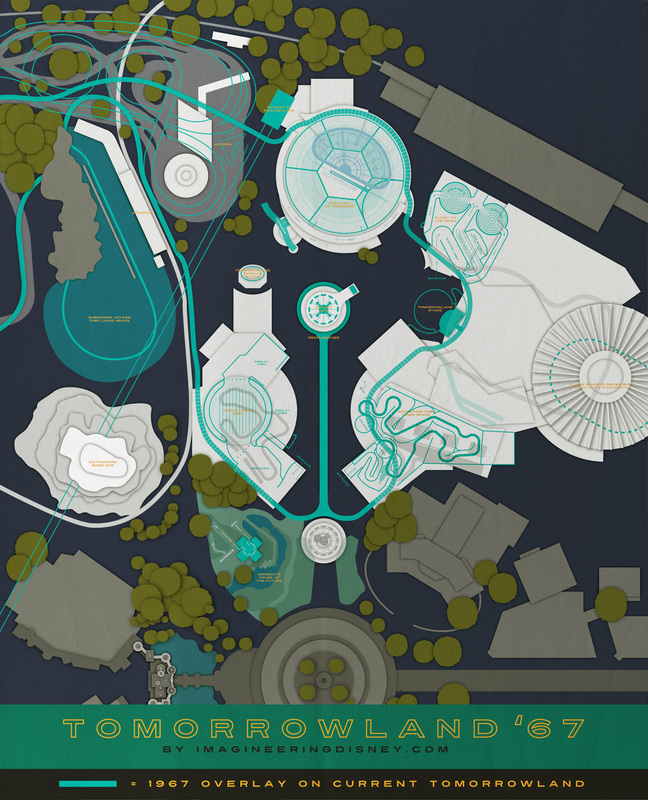 We hope everyone learns a little more about Disneyland’s Tomorrowland. Stay tuned. Portão basculante para garagens de residencias, portão basculante para condomínios. WOW!! Cannot wait for the entire series. We can only hope that if/when WDI gets the money and go ahead to redo Tomorrowland that at the very least they can (a) somehow bring back the People Mover, and (b) put the Astro Jets back where they belong. Curse you Paul Pressler for moving it almost on top of the hub. Why does it say "Flying Saucers (Never Built)" Am I missing something? Is that Roy E. Disney on the Peoplemover in the first video? Tahitian Timmy- Thanks! We are excited too. Brett- GREAT question. One I will address in the series. But I'll tell you now that I don't really know anything about it other than it shows up on some blueprints during this time. The previous Flying Saucers were in that general area a little further north and had a very similar layout. Bruce Wright- I have always thought so. I have no way to confirm it but it looks just like him. I want that first image as a massive wall poster. It's so beautiful! Cannot wait for the rest of this series. Thank you for doing this. You're the cat's pajamas! I was lucky enough to grow up with the post-Space Mountain 70s version of Tomorrowland. Missed the Carousel of Progress, but I have fond memories of America Sings. Was fortunate to experience Adventures Through Inner Space, but love Star Tours. Too bad we can't have both. I don't mind Astro Blasters, but the sign needs to be upgraded. Wow, what a wonderful post. Thanks for all of the hard work that obviously went into this! August 26, 2012 | T.T. I love the detail of the story and the graphics as always. The custom marquee map at the top is awesome! The layering that tricks the eye into almost seeing the elements (i.e. the Matterhorn) in 3D reminds me of the intro to ‘Game of Thrones’. I also like the special Disneyland 1959 insert art. Did the double-decker bus ever take passengers under the Monorail track and past Tomorrowland as depicted? All these years I thought those wings on Tomorrowlands opening were Alcoa Aluminum. My friend and WED Tomorrowland 67 Designer George McGinnis told me no they were made of Fiberglass. I'm glad they are still there today. Sorry the Mary Blair tiles are not. It's almost too late! ! Their after me!